Carrier oils are naturally derived from plant-based extracts and can be a wonderful alternative to the chemical fillers that are found in most moisturizers on the market. The name “oil” can alarm some, especially those with oily skin types who may believe that applying oil will just cause breakouts and clogged pores. 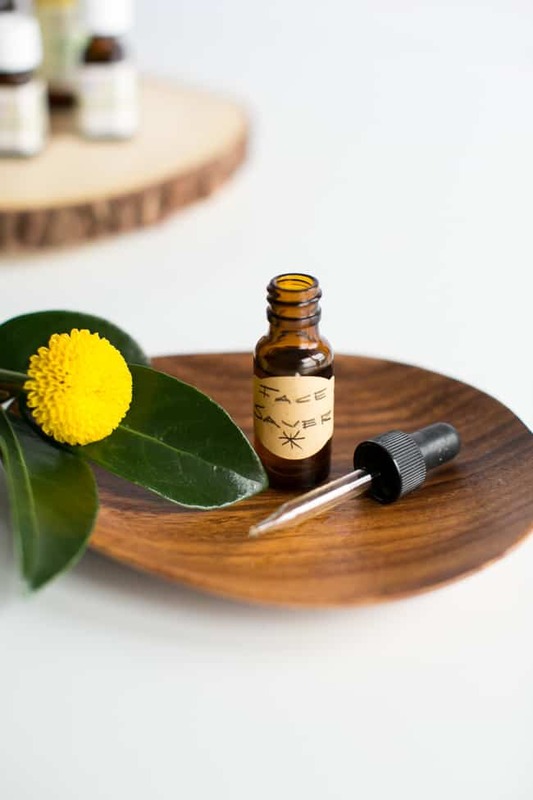 Truth is, there’s an oil out there for everyone, and you can easily whip up a DIY face oil that’s customized to your skin’s needs. The need to know the right type of oil for your skin is crucial. There are oils that can benefit all skin types, even oils that can help balance oil production and fight the bacteria that causes acne. 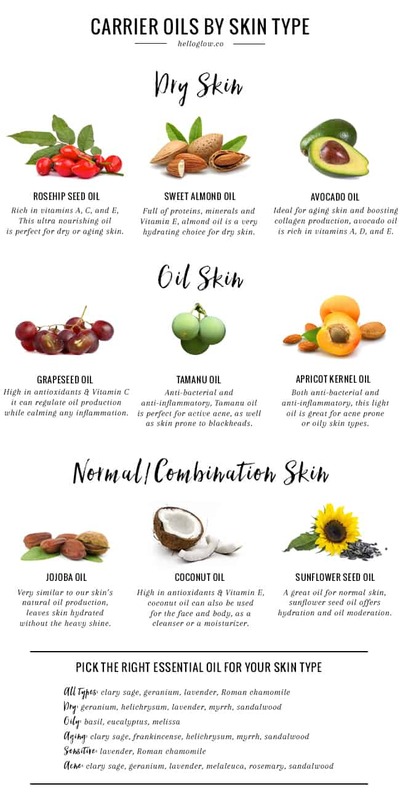 Depending on the season and the climate where you live, you will want to change carrier oils to meet the changing needs of your skin. With a carrier oil carefully chosen, you can customize it with essential oils to create a perfect blend for your skin. Once you mix your first facial oil, you’ll never look back. Rosehip Seed Oil– This ultra nourishing oil is perfect for dry or aging skin, especially the area that shows signs of aging the earliest: the eye area. Rich in vitamins A, C, and E, this oil can be used alone or in conjunction with another oil for optimal benefits. Sweet Almond Oil– Full of proteins, minerals and Vitamin E, almond oil is a very hydrating choice for dry skin. Avocado Oil– This oil is my personal favorite, ideal for aging skin and boosting collagen production. Avocado oil is rich in vitamins A, D, and E and improve skin elasticity. Grapeseed Oil– If oil production is on the heavy side, grapeseed oil is both lightweight and can regulate oil production while calming any inflammation. It is also high in antioxidants and Vitamin C.
Tamanu Oil– For oily and acne prone skin, this oil is anti-bacterial and anti-inflammatory. Tamanu oil is perfect for active acne, as well as skin prone to blackheads. Apricot Kernel Oil– Both anti-bacterial and anti-inflammatory, this light oil is great for acne prone or oily skin types. Jojoba Oil– Almost all skin types can benefit from jojoba oil, which leaves skin hydrated without the heavy shine. Jojoba oil can also be used for the entire body, and is very similar to our skin’s natural oil production. Coconut Oil– Easy to find and popular, coconut oil remains a beloved choice for many. High in antioxidants and Vitamin E, coconut oil can also be used for the face and body, as a cleanser or a moisturizer. Sunflower Seed Oil– A great oil for normal skin, sunflower seed oil offers hydration and oil moderation. 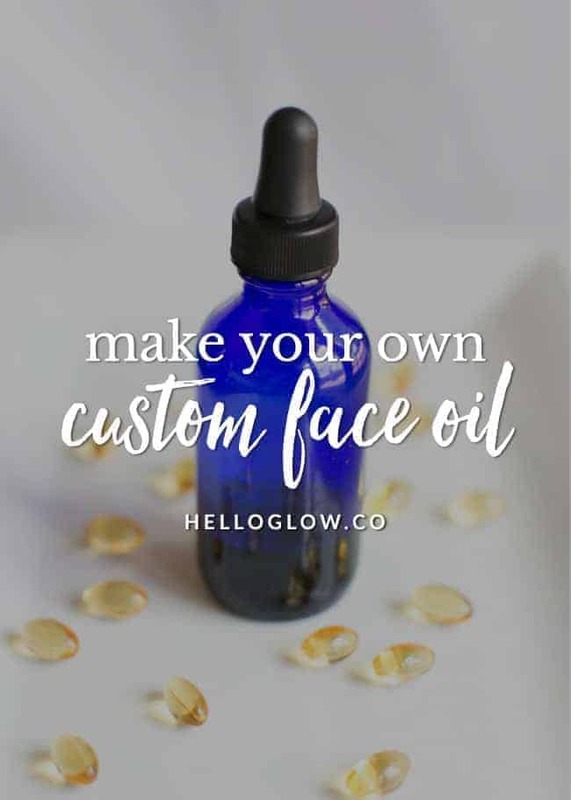 Be sure to use a glass bottle to store your custom face oil.Darker color glass protects the integrity of the oils, so the darker the better. For every ounce of carrier oil, add 1-2 drops of essential oil. If you're feeling adventurous you can use 2-3 carrier oils that address different skin needs. Carrier oils can be mixed with equal parts in the same jar. On blending 2-4 different essential oils, how much carrier oil should I use. How often is it recommended to use on your face? Daily after cleansing or once a week? However, I am not sure I get it – about the carrier oil (maybe because English is my second language). Can you give 1 or 2 examples of a complete mix recipe? “Carrier oil” is any of the first oils mentioned, for example, rosehip, sweet almond, avocado, grapeseed, tamanu, apricot kernel, jojoba, coconut or sunflower seed. Carrier oils can be used straight on your skin. The other oils (the essential oils) need to be diluted by the carrier oils before they can be used straight on your skin. I’ve been making my own facial oil regularly, and I love it. I use grapeseed oil with lavender and lemongrass essential oils plus a little vitamin E oil.